Every AirPort base station these days has three free Ethernet ports (in addition to the one that connects to your broadband modem), so it's easy to expand your wireless network with wires. There are many times when such wired connections make more sense than wireless alone. If your wireless network is lagging, especially when transmitting large files, wired Ethernet—specifically, Gigabit Ethernet—is your first and best option for getting it back up-to-speed. Gigabit Ethernet has ten times the throughput of even the fastest real-world AirPort Wi-Fi connection, and it never suffers from interference or dropouts. You can back up your Mac, the kids can download movies, and your spouse can stream music from the family iTunes library, all at the same time, without bogging down your net. Desktop Computers If you store a shared iTunes library, videos, or family photos on a particular desktop Mac, or if you share peripherals such as printers or DVD burners from it, and if that shared computer is in the same room as your Airport base station, you should always connect it to that base station with wires, not wirelessly. Even if the Mac and the base station aren’t in the same room, you should still consider wired Ethernet; room-to-room cabling isn’t that hard or messy (see “How to Install,” below). Streaming Video Hardware, Including Apple TV and TiVos Because it buffers video on its internal hard drive, Apple TV does not demand a faster wired connection—but it can still benefit from one, because it makes those downloads faster, takes a load off your wireless net, and lets you start playing those downloads sooner. Streaming video boxes such as the Roku Netflix player and Slingbox, and game consoles such as the PS3 and Xbox 360 (which stream video in real time and don’t save it to disk), can benefit more. Most have built-in or optional Wi-Fi adapters, but those connections are especially prone to choppiness and dropouts. These devices can be a bit harder to wire up to your network, because they aren’t likely in the same room as your AirPort base station or the computer where you store your video files. But, again, it’s doable. NAS (Network-Attached Storage) Drives NAS drives are hard drives or disk arrays that attach directly to your network. (See “Network-Attached Storage,” macworld.com/tktk[CB1].) They are great for network backup or central storage for shared files and media collections. While some have built-in Wi-Fi, all have Ethernet ports; you should use the latter, because shuttling files is much faster over wires. Adding wired components to your wireless network isn’t really worth it unless you’re using Gigabit Ethernet. All Intel Macs, as well as iMacs released since mid-2005, PowerBooks since late 2001, and Power Macs since mid-2000, have Gigabit Ethernet. (To see if your Mac qualifies, select Apple: About this Mac, click on More Info, select Network in the Contents sidebar and Built-in Ethernet in the Active Services subwindow, and then look up Media Subtype in the subwindow below.) Routers have come late to the Gigabit party: Apple has offered Gigabit on its AirPort base stations since mid-2007, when it introduced the Gigabit AirPort Extreme. 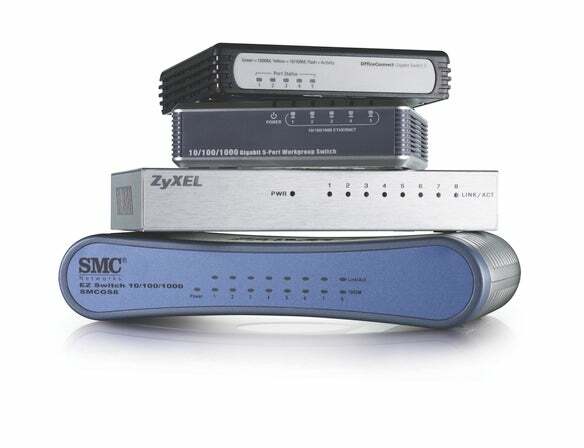 From top to bottom: 3Com OfficeConnect Gigabit Switch 5; Linksys EG005W; Zyxel GS-108B; SMC SMCGS8 EZ Switch. If you don’t have Gigabit Ethernet, your wired connections will only run at 100 Mbps, negating many of the advantages of wired over wireless. If you already have a Gigabit router, and enough empty ports on it for all the devices you want to wire up, you’re all set. If you don’t have enough empty ports on your router, or if you’re using your Mac itself as your wireless base station, you can add more ports with an Ethernet switch. A switch is just a box with a bunch of Ethernet ports that manages network traffic among the devices connected to it. Unlike Ethernet hubs, switches are intelligent, directing packets to the right ports, avoiding collisions, and allowing for much higher effective speeds than with hubs. Finally, when it comes time to wire these switches into your network, make sure that you use Cat 5e cable for all your connections. Cat 5e supports Gigabit Ethernet, while standard Cat 5 is rated up to 100 Mbps only. Installing an auto-uplink Ethernet switch is easy. You just plug an Ethernet cable from the router in to the switch and then plug all your devices in to the remaining ports. The switch does the rest. If your switching isn’t auto-uplink, it may have a separate uplink port for plugging in the cable from the router. The switch does not have to be in the same room as your router. If you have an attic or basement office with multiple devices you want to wire up, or if you’re connecting multiple devices in your living room, you can run just one Ethernet wire from your base station to the remote location and then use a switch to connect everything. Running Ethernet wires a long way is easier than you think. If there is an attic or crawl space above or below, you can simply poke through the floor or ceiling, run the wires out of sight, and poke back in again in the desired location; you can use wall plates (like electrical outlet covers) to hide the holes. If you have to run wires within rooms, look for flat, adhesive, and paintable Cat 5e Ethernet cabling that can run unnoticed along baseboards and moldings, such as FlatWire. Video Products Inc sells a slightly thicker flat Cat 5e cable that works well under carpets.